Emma Watson Updates: Emma Watson: "Hermione is emotional, angry and crazy, so it was fun"
Emma Watson: "Hermione is emotional, angry and crazy, so it was fun"
QUESTION: So, this is the first time the audience has really seen a more vulnerable side of Hermione. How do you feel about bringing this side of her life to the screen? EMMA WATSON: I really enjoyed playing the more vulnerable side to her character. She’s quite emotional, angry and crazy, so it was fun to play her. QUESTION: What was the most challenging aspect shooting this film? EMMA WATSON: The most challenging aspect of this film was the fact that I was trying to take my A-levels at the same time I was filming. So my life was crazy. One minute I was on set, and the next minute I was doing an exam, or reading a textbook, or doing something, so I was a bit all over the place. Sometimes it’s kind of hard to juggle both aspects of my life. QUESTION: And what about acting-wise? Was there something that was really difficult as far as her character? QUESTION: But how do you do it? Do you think of something sad? What do you do to make yourself cry? QUESTION: Was there a scene or sequence that you really enjoyed filming for Harry Potter and the Half Blood Prince? EMMA WATSON: I really enjoyed the Quidditch sequence with Ron just because it’s always nice to do a bit of comedy. And I just thought the whole thing was hilarious, so I really enjoyed it. QUESTION: This is the second time you’ve worked with this director (David Yates). Does that affect or change what it’s like for you to come to set every day? EMMA WATSON: Yes, I guess it does. In the first Harry Potter that David directed, (Harry Potter and the Order of the Phoenix) he was really finding his feet, meeting lots of new people, and working with a crew that had already worked together. And now, he’s very much part of the team and I think he felt a lot more confident. Not that he wasn’t on the first one, but I think everyone was just more settled, which was nice. QUESTION: Hermione and Ron obviously have a bit of a romance in the movie. Were you excited for this storyline? EMMA WATSON: Yes, I was very excited. It might not be the most obvious storyline in a way. I think a lot of fans always saw Hermione and Harry together, but I think that Hermione and Ron are very strange, but kind of perfect for each other. They’re very different, but you know, they make each other laugh. Ron lightens her up. Hermione’s quite a serious character, so I think they’re good for each other. QUESTION: It seems that it would be more fun to play Hermione when you’re in a scene with Ron, because he looks like he’s having a good time? EMMA WATSON: Definitely. Yes. I like doing scenes with Rupert because we get to kind of bounce off each other and they tend to be the funny ones. QUESTION: Can you talk a little about the balance between the romance and the comedy, and the action and danger in the film? EMMA WATSON: Yes, there’s definitely an impending sense of danger in this film. The very opening sequence, is like a terrorist attack with the Dementors, and we’re very aware that Voldemort is back. And so there’s definitely a sense that things are kind of heating up, basically for the last film. So yes, it’s a very exciting film. QUESTION: What do you enjoy playing more, the comedy, the adventure or the danger? EMMA WATSON: I suppose it’s nice to do a bit of everything. It’s nice to play a variety, which I think is great. You know, to do one scene that’s really comic, and then do another scene that’s very serious, and then do another scene that’s all about the action – stunts or running, or whatever crazy thing they’re doing, I think variety is definitely the best. QUESTION: How has this film stood out amongst the other five? EMMA WATSON: This one definitely stood out to me as more of a romantic comedy. For once, it’s not really so plot focused, or plot driven. It’s much more character driven. It’s much more about Hermione, Harry, Ron, Ginny and their stories, and what’s happening in their school year. It’s just more about us. So it’s nice. QUESTION: Now that you’ve seen the film, what’s your favorite storyline to watch, or what are some of your favorite moments? EMMA WATSON: My favorite moments are Ron playing Quidditch. I just think he’s hysterical. Also, Ron taking a love potion. I think he’s really funny, so for me those moments are my favorite. QUESTION: What surprised you the most the first time you saw the film? It must be strange to spend so much time on these scenes and then you sit down, you watch the film and it all comes together. 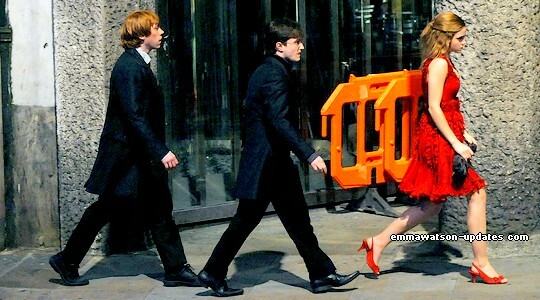 EMMA WATSON: Yeah, it’s really strange. You’d think that there wouldn’t be a lot that would surprise you, but even the third time I was watching the film, there’s this moment where the Inferi come out of the lake and one of them grabs Harry. And every single time I watch that, I jump out of my skin! I’m just like, oh my God! I really jump! This film is still great to watch. QUESTION: Can we discuss the first film? Rewinding back to the beginning. What is your favorite moment or scene from Harry Potter One and the Sorcerer’s Stone? EMMA WATSON: It’s hard for me not to watch the first film and for it to be so memorable. I get very sentimental. I love watching it. It’s great to watch the scene where I come onto to the train for the opening sequence. I’m really fond of that sequence because it was also my audition tape. I did that scene so many times and then when I did it in the film, it was the first time I’d ever seen myself on screen. It was one of my first big scenes and so, that has a lot of significance and meaning to me. So, yes, I have a lot of fond memories. QUESTION: It’s really the beginning. EMMA WATSON: Yes, it is. QUESTION: The troll scene from Harry Potter and the Sorcerer’ Stone, was that kind of a turning point in the relationship between you, Harry and Ron? EMMA WATSON: Definitely. The troll sequence is the turning point in their friendship because Ron is horrible to Hermione and he hates her because she’s such a goody two-shoes. Hermione sticks up for them and shows them that she cares more about them and their friendship than she does t sucking up to teachers. So they kind of bond there at that moment and they realize that she’s kind of okay, and they become friends. And that’s where it all begins. QUESTION: Do you enjoy re-watching the films or is it difficult? EMMA WATSON: It’s kind of painful, to be honest. The very early films, I kind of enjoy watching because I’ve had quite a lot of distance from them, so I feel quite disconnected. But the fifth, the fourth, maybe even the third film, I find a bit cringy to watch. QUESTION: Oh, it was all so cute! And, that’s kind of your yearbook. You probably remember what you were doing during those scenes, and where your life was? EMMA WATSON: No, it literally feels like a different lifetime. I look at myself and it’s like a different girl. It’s very strange. QUESTION: Your character has quite a crush on Gilderoy Lockhart in Harry Potter and the Chamber of Secrets. How do you think this helps develop the character? Do you think it does? EMMA WATSON: I think it’s very endearing. Hermione has a crush on a teacher and I think it’s even more endearing that he turns out to be such an idiot. And that it’s all a big mistake, really. I think it’s just humorous. It’s just funny.